I post so many Lebanese and German recipes, that often I forget my third favorite food! And that is Filipino! I probably cook filipino dishes a couple of times a month, (so not as often as German and Lebanese) but we enjoy their food no less. This recipes is one of my favorite dishes to gook with aubergines. It is quite flavorsome, filling and the perfect comfort food on a rainy Sunday. 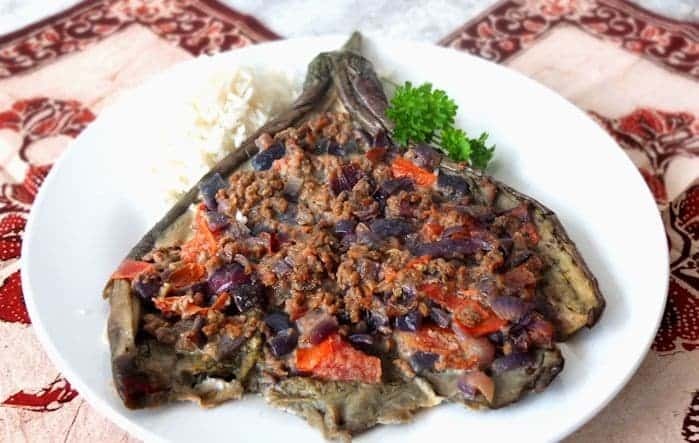 When I think of stuffed aubergines, I always see the Mediterranean version stuffed with feta cheese, lamb mince and tomatoes. But this dish is very different. 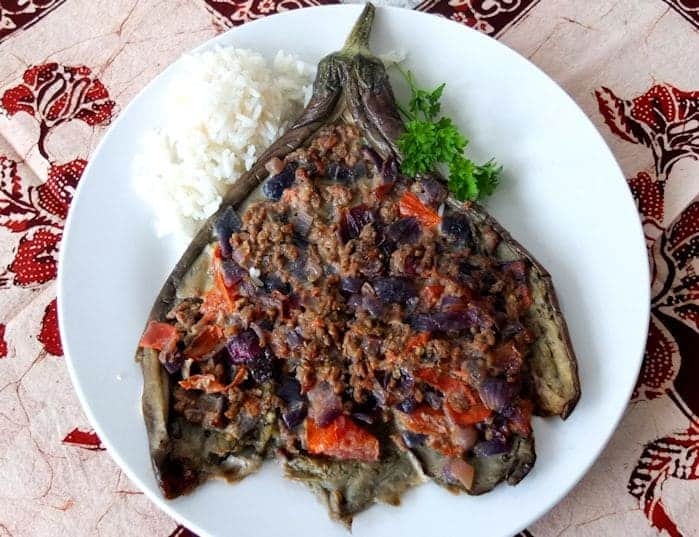 For starters, after you have boiled the aubergines, you flatten them so it resembles more a plaice fish than a round eggplant. Before placing the aubergines in the oven they are topped with an egg mixture. (Filipinos love egg) Some versions of this recipes put so much egg on it that it resembles more an omlette than an aubergines, but I prefer this version. 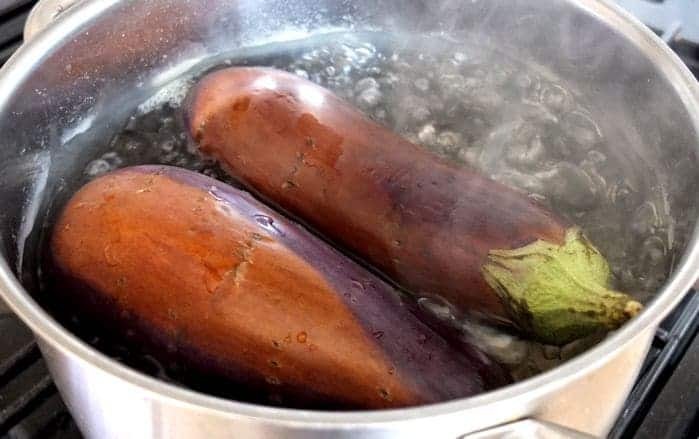 Pierce the aubergines with a fork, place in a large pot of boiling water and cook for about 10 minutes until tender. Holding them by their stalks, slice them lengthwise to open them like a book. ( do not slice all the way through and leave the stalks intact. 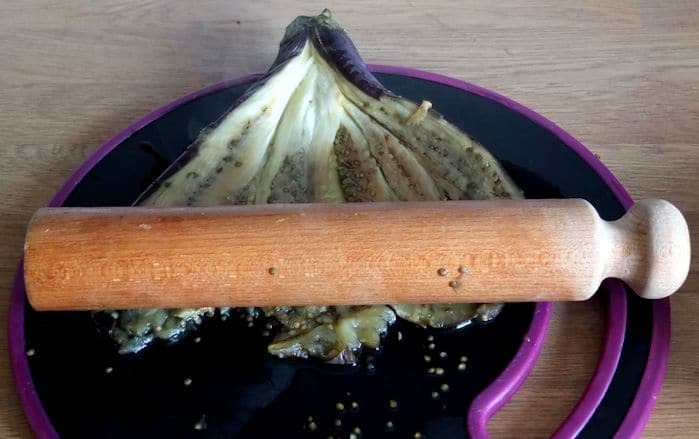 Place the aubergines on a clean surface and flatten with a pestle, large spoon or I just used my rolling pin. Set aside. Head a large frying pan over medium heat and add 1 table spoons of oil. Add the garlic and fry until lightly browned. Add the onion and tomato and saute for about 3 minutes. Add the beef and saute for 5 minutes. Add the salt, pepper, sugar and stir to combine. Remove the meat mixture from the skillet and divide into four portions. Set aside. Beat the eggs in a large bowl. Submerge each aubergine in the egg and place cut-side up on a large baking tray. 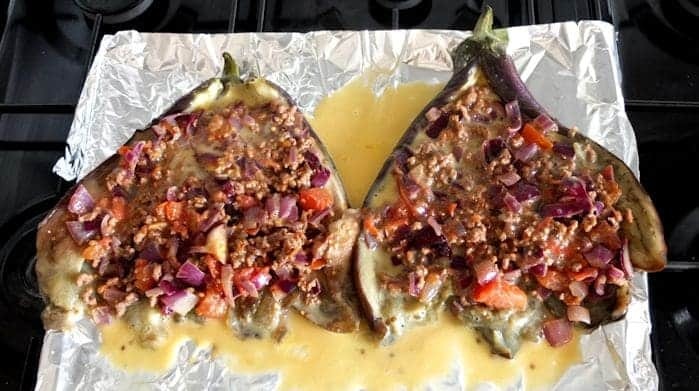 Top each aubergine with one portion of meat mixture and spread it evenly, pressing firmly, Pour the remaining egg over the stuffed aubergines. Preheat the oven to 200 degrees Celsius. Bake the aubergines for about 30 minutes.